When temperatures rise in Spring, when hurricane season comes around, or when there are excessive rainfall levels – products are needed immediately to get preventative and cleanup efforts moving. Apache can help. We have bulk hose, pre-made assemblies, pump kits, strainers, and connection adapters to fit today’s pump models. 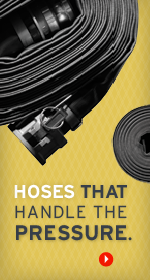 So… how do you know which hose is best suited to your application? The most popular suction hoses for general water removal are Apache’s Style G (green) and Style K (clear/white). Both are constructed of an abrasion resistant PVC compound with a rigid polypropylene helix, and are rated at full vacuum. The clear PVC option does have the advantage of allowing the operator to see water flow, and visibility to check if the strainer is preventing damaging solids from passing through the pump. In pumping applications that include trash and solids, we recommend using our yellow poly/rubber (also referred to as fertilizer solution hose) or our rubber suction hose. Both options have an EPDM rubber tube, offering greater wear resistance than the PVC suction hoses. Our most popular hoses for general water removal are the lay-flat style discharge hoses, available in standard-duty (blue) and medium-duty (brown). Both are designed for “open end” water discharge, but have distinct application differences. Standard-duty blue lay-flat hose should only be used to discharge water over horizontal or declining grade, because it has a very low PSI rating (30-80* PSI). As grade increases so does pump head pressure, requiring a higher rated hose like the medium-duty brown layflat, which has a 150* PSI rating on all sizes through 6" ID. In discharge applications that have a lot of trash and solids, you should consider our rubber water discharge hose, which has wear resistant EPDM tube and many times greater service life. All hoses can be assembled with pin lug (short shank) couplings, or cam and groove style couplings. Available in aluminum, stainless steel, or polyethylene, these couplings can also be purchased individually. Apache's standard water transfer pump kits are available, in 1", 1-1/2", 2", 3" and 4" sizes. Kits contain a suction hose, discharge hose, strainers, and our most common fitting configurations. *PSI ratings are based on 68° Fahrenheit. As temperatures increase, pressure ratings decrease.